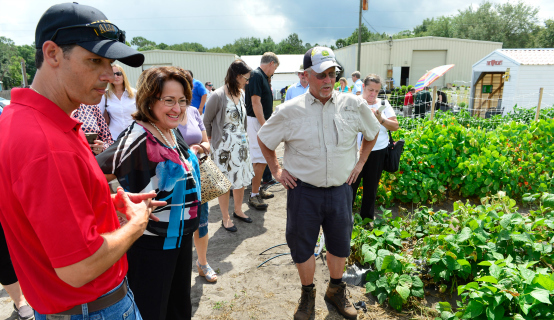 Orange County Mayor Teresa Jacobs recently toured the unique pilot garden at Edgewood Children’s Ranch where new agricultural methods are being tested with Valencia College horticulture students. Edgewood Children’s Ranch is a nonprofit organization that helps children, teens and their families address behavioral issues. The live-in facility offers spiritual guidance, academic remediation, and behavioral training for children and teens. Earlier this year, the 2014 Teresa Jacobs for Mayor Campaign donated $4,500 in excess campaign funds to the Ranch’s farm project. The donation enabled Valencia and Edgewood volunteers, who assist with the farm, to buy equipment that doubled food production. The newly-purchased equipment forms wider beds, lined with drip irrigation and plastic that keeps nutrients and water in the soil, increasing the yield. Mayor Jacobs has been a long-time supporter of Edgewood Children’s Ranch, a rehabilitative program that houses 50 to 60 youth, ages 7 to 17. Children live in cottages with house parents and attend school on the premises. Many of the children come from troubled backgrounds and may be struggling at home or in school. Ranch staff assist by helping the children, teens and their families in addressing behavioral issues, and if possible, in reuniting children with their families. Valencia College professor and horticulture program director Javier Garces first began a small garden project at Edgewood in the fall of 2013 to give students real-world experience. The 107-acre ranch is just a few miles from the Valencia West Campus. From just 2,000 square feet, the garden has blossomed into 21,000 square feet and serves as an educational laboratory for more than 20 Valencia students and the children at Edgewood. Many work on the farm on a weekly basis. About 80 to 90 percent of the vegetables consumed by Edgewood are homegrown. The excess crops help raise money to support the initiative. Regular customers order their produce each week and pick it up, and produce is also being sold to Valencia faculty and staff. The remaining produce has been provided to other nonprofits in the area. In addition to traditional raised-bed field production, Valencia’s horticulture students learn about different planting techniques, such as box gardens, hydroponic gardens and vertical planters. They learn how to drive a tractor, to practice different irrigation, fertilization and water conservation methods, and to conduct pest management in the fields. Nearly 58,000 jobs are slated to open annually over the next five years across the U.S. in occupations involving food, agriculture, renewable natural resources, and the environment, according to a May 2015 report released by Purdue University’s College of Agriculture. The real-world experience for Valencia students is proving to be a job creator. Garces has a nearly 100 percent placement rate for students seeking employment in horticulture related fields, and the future looks good for his 160 students in the program.